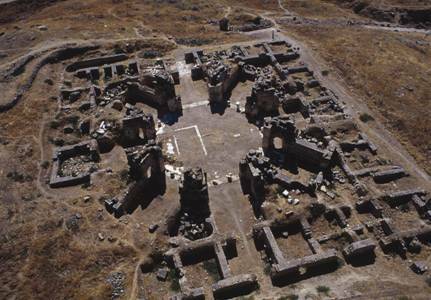 The activities of Italian Archaeological Mission in Hierapolis di Frigia (Pamukkale), an important Roman-Hellenistic city of Frigia , started in 1957. The Mission is directed by Francesco D’Andria (University of Lecce ) in collaboration with Italian and foreign Universities and Institutes. 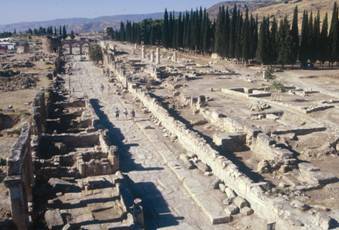 Hierapolis , an important Roman-Hellenistic city of Frigia , dominated the valley of the Lykos River and was located along a road linking the internal part of Anatolia to the Mediterranean . The ruins of the ancient city are found in the province of Denizli , in a resort called in Turkish Pamukkale, “castle of cotton” named after the white travertine formations created from the flow of water that spouts out from the hot springs . 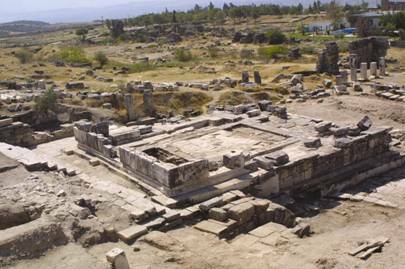 Recent excavation activities have allowed us to recognize and understand the urban grid of Hierapolis , referable probably to the Hellenistic Period, with a principle axis (plateia ) going from north to south. A grid system of long and rectangular blocks oriented from E-W originated from this axis. Public buildings and private houses were arranged according to the urban grid. In the northern part of the city, along the road that leads to Tripoli , the first nucleuses of the necropolis began to be formed between the 1st and 2nd centuries BC. The necropolis developed in the Roman Period, with graves and funerary buildings. 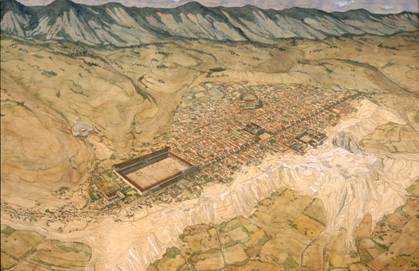 The current appearance of the city took shape in Flavian times, after the disastrous earthquake in the year 60 AD., and also during the 2nd and the 3rd century AD., when monuments such as the theater, the enclosure of the temple of Apollo , the commercial Agora, and two large public nymphaeums were built. 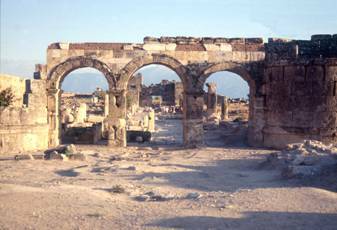 The development of the city suffered a sharp halt during the course of the 4th century AD, due to a violent earthquake that completely destroyed many areas, including the commercial Agora. With the construction of the fortified Byzantine wall, at the end of the 4th century AD, the northern part of the city, including the commercial Agora, was left outside of the urban perimeter, and utilized as a quarry to recover building materials. 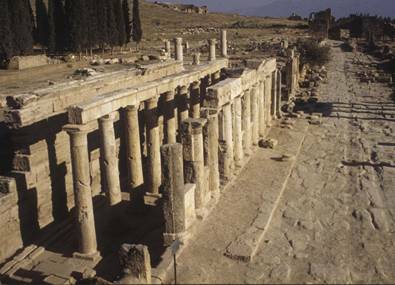 During this phase Hierapolis became an important centre for Christianity and along the main street they built the so-called Bath-Church, the Cathedral with the Baptistery, the Pier Church , and on the south eastern hill, the octagonal Martyrion of St. Philip. At the end of the 6th century AD another earthquake caused the collapse of most of the Hierapolitan buildings including the Byzantine walls. The most recent excavation campaigns have also centered on the medieval phases that attested to the ruralization of the city, which was composed of scattered agricultural plots developed in a manner that did not respect the ancient axial plan. On a rocky spur to the west of the plateau a castle was built to control the valley below. The building, which occupies about four blocks of the urban grid, leans towards the rocky slope. The cavea is very steep and was horizontally divided into two parts by the middle diazoma and vertically by 8 staircases forming 9 kerkides; a gallery was on top of the cavea. 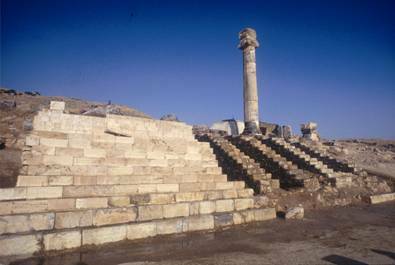 An wide marble exedra of proedria had high backed seats with lion paws. 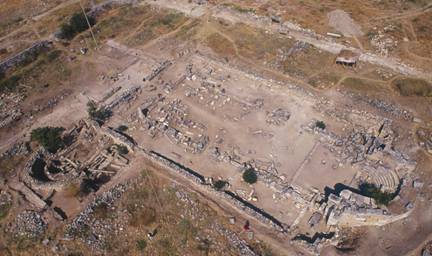 The exedra was placed at the centre of the ima cavea and it hosted dignitaries of high rank. The cavea was linked to the scenic building creating a closed and unitary structure according to the Roman architectural models. The scenic building was divided into a logheion and a scene. From the scene only the first floor has been preserved. The upper part collapsed on the stage and on the orchestra. The wall of the front scene rested on the podium with exedras that corresponded with the three main doors. The podium was decorated by a series of marble reliefs with a figurative cycle dedicated to Apollo and Artemis. In 2005 began restoration works of the scenic building .